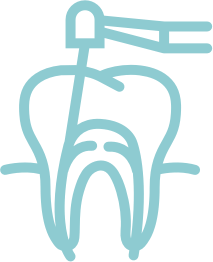 Dental X-Ray: If the dentist believes you need a root canal, an X-ray is necessary to locate decay. Anesthesia: A local anesthetic is applied to the affected tooth. Pulpectomy: An opening is created, the dead tooth pulp is discarded. Filling: The newly-formed opening is filled with a rubber-like material called gutta-percha and is sealed off. You can read more about the root canal process here. The root canal is heralded as one of the more painful dental treatments, but is this fact or just urban legend? The short answer: This claim is fiction! Over time, the process has become more refined, resulting in a simpler, less painful treatment. In fact, many patients liken the discomfort to nothing more than what you would expect out of a typical filling procedure. The process may not be as painful as it once was, but the infected tooth and gums can be incredibly painful. By undergoing a root canal, you relieve a greater pain that you may have had to endure later. For more information regarding root canal treatments, contact Magnolia Dental today!